New Delhi: The government has generated close to Rs 20 crore as revenue in just three months from over 7.8 lakh visitors coming to see the Statue of Unity at Kevadia in the Narmada district of Gujarat. Union tourism minister KJ Alphons gave this information in a reply to a question raised by BJP’s Varun Gandhi who inquired about the developmental work around the Statue of Unity. In his written reply, Alphons mentioned that, as per the information provided by Sardar Vallabhbhai Patel Rashtriya Ekta Trust, the number of tourists who visited the Statue of Unity in Kevadia in three months from November 2018 to January 2019 was 7,81,349 as against the yearly average of 8,22,009 tourists visiting Sardar Sarovar Dam in Kevadia in the past five years. Alphons mentioned further that revenue generated from visitors to the Statue of Unity from November 2018 to January 2019 was Rs 19.47 crore. 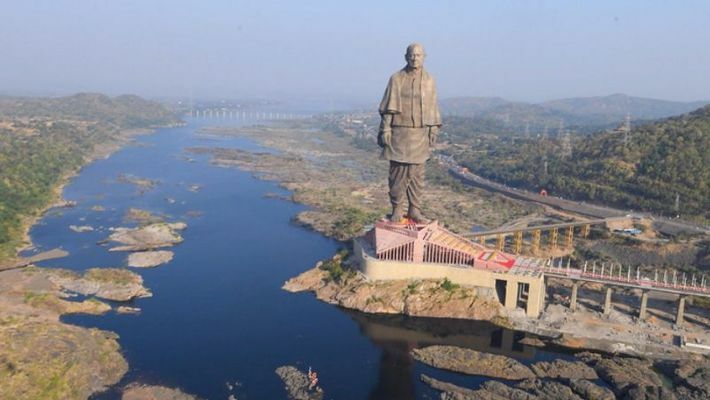 Sardar Vallabhbhai Patel's statue, the tallest in the world, stands on a river valley in Gujarat’s Narmada district. It is fast becoming one of the top tourist attractions of the country. The statue, conceived by then chief minister of Gujarat and current Prime Minister Narendra Modi in 2010, pays tribute to Independent India’s first home minister who was instrumental in getting 562 princely states to accede to the Indian Union after Independence. The state government expects the tallest statue of the world to give a major boost to tourism in Gujarat. Alphons, in his reply, highlighted the government's plans to develop the area around the statue to increase employment and tourism in the adjoining areas. He said that the government had decided to develop a jungle safari, an amusement park, an adventure and eco-tourism park, a children’s nutrition park, boating from the Shreshtha Bharat Bhavan to the Statue of Unity, food court, a mirror maze and a cactus garden. Currently, there is no direct air or train connectivity to Kevadia. The nearest stations to Kevadia are Vadodara (71.94 km), Bharuch (75.36 km) and Ankleshwar (77.95 km). A smaller station, Miyagam Karjan, is 63.02 km from the town. In December 2018, President Ram Nath Kovind had laid the foundation stone of a rail station in Kevadia. For air travel, one has to take a flight to Surat. Kevadia is 83 km from Surat. From Ahmedabad airport, the Statue of Unity is almost 200 km away.